Max is a 4-year-old sable GSD. He is a very big lad with a lot of strength and a high ball drive. Unfortunately, he was left for rehoming at kennels due to a relationship break up. 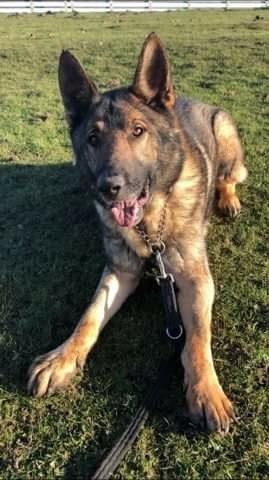 At the kennels, he was very nervous and reactive but here with GSDR he has calmed down and interacts really well with the volunteers. He is a high energy boy who loves to be on walks, playing with his ball or clowning around. He can be a bit nervous initially but this is soon forgotten when he sees the toy. He has never lived with children and due to his size and clumsy bouncy nature, he wouldn’t be suitable to live with children. Max is neutered and vaccinated up to date.